TEL AVIV, Israel (CNS) — A refugee’s life is one of constant uncertainty and confusion. Yet in their faith the refugees have found strength and refuge, said Father Rafic Nahra, priest of the St. James Vicariate, which ministers to the asylum seekers and migrant worker community in Israel. Late April 2, Israeli Prime Minister Benjamin Netanyahu suspended a U.N. deal that would have sent thousands of asylum seekers in Israel to Western countries rather than to Africa. The deal had been announced hours earlier, but its reversal did not surprise the refugees. 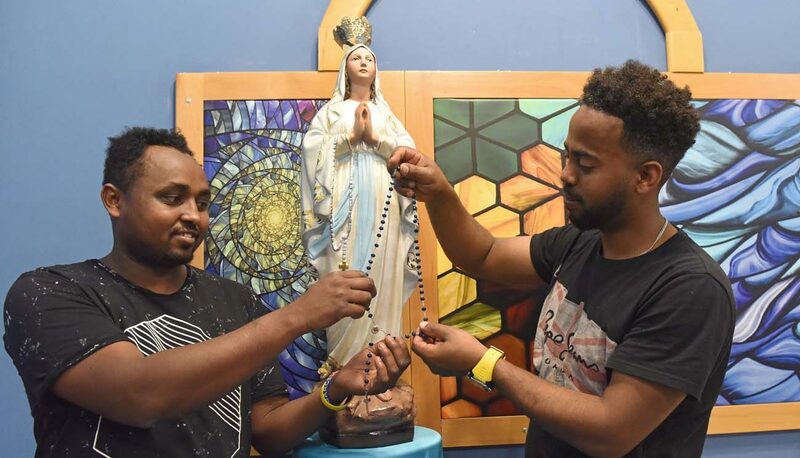 Sitting in the courtyard of the Our Lady Woman of Valor Tel Aviv Pastoral Center in late March, two Catholic Eritrean refugees, Abel Kflom, 27, and Musia Daniel, 30, said they do not feel certain of their future. Both men fled during compulsory military service in Eritrea, which kept them away from their families for years. In the army, they said, people become like slaves to the commanders. Some men are forced to serve in the army until their 60s. There is no time limit to the service; people cannot decide when to leave. Neither had intended to come to Israel. Kflom was kidnapped by members of the Rashaida Bedouin tribe, who took him and his friends from Sudan into the Sinai Desert, where he was brutally tortured for four months until his family was able to pay $19,000 in extortion money. He was released at the border with Israel. During his captivity, his childhood prayers sustained him, he said. Now, early every Saturday morning, Kflom walks with his wife and young son to the pastoral center for a traditional three-hour Eritrean Mass. Netanyahu has said he wants to deport 20,000 refugees — whom he maintains are mainly economic migrants — by the year 2020. If his original deportation plan is implemented, the deportation process will require single adult males to choose between a financial incentive for “voluntary deportation” to a third African country or indefinite incarceration. Israel is not alone in struggling with a deportation policy. Countries such as Australia, Germany and Greece have implemented similar deportation policies, including financial incentives for refugees to leave or face incarceration. Following the October 2016 European Union declaration of “safe zones” in Afghanistan, other countries began to deport Afghan refugees. France will be debating a controversial migrant deportation bill in April. Without hesitating, Daniel and Kflom said they would choose incarceration over deportation to Africa. African refugees began reaching Israel via the Sinai Desert in 2005, and by 2013, there were 60,000 African refugees in Israel. As the numbers of refugees grew, the government began taking measures to prevent or discourage them from reaching Israel. In 2013, Israel completed work on a border fence with Egypt and, since last year, the flow of refugees stopped. Today an estimated 38,000 adult refugees remain in Israel, the large majority from Eritrea and about 20 percent from Sudan; smaller percentages come from other African countries. According to the Hotline for Refugees and Migrants, of the more than 13,700 applications for asylum submitted by Africans, only 10 people have been given refugee status in Israel. Some 200 Sudanese refugees from Darfur also have been granted humanitarian status. Father Michael Gropse, director of the Tel Aviv pastoral center, said when the refugees come to weekly Mass, their prayers are in earnest.